The largest outcrop of Cambrian rocks in southern Britain is found in north Wales. Cambrian strata also crop out at St David’s Head in Pembrokeshire, along the Welsh Borderlands at Shelve and from Telford to near Kington. They occur in the Midlands at Nuneaton and Charnwood Forest in Leicestershire where the Neoproterozoic rocks also occur in faulted inliers. The most southerly outcrop is in Cornwall where slivers of Cambian strata (too small to show on the ‘ten-mile’ map) are caught up within the Lizard Complex. Cambrian rocks are hard and indurated; the strong profile of the Rhinog Mountains in north Wales is typical of the landscape formed on these strata. Soil development tends to be poor but this allows a wilderness of heather and gorse to thrive in many areas(Plate P667856). 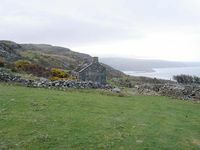 Abandoned farmhouse on the craggy slopes of the Cambrian Rhinog Grit Formation near Barmouth. P667856. Cambrian trilobite (latex cast), Olenus micranus, Mawddach group. P669504. The Cambrian, the oldest period of the Palaeozoic Era, was the time when marine creatures developed hard parts and consequently large numbers of fossils appear in the geological record for the first time (Plate P669504). Rifting along the edge of the supercontinent of Gondwana had begun in latest Neoproterozoic times leading eventually to its fragmentation (Figure P785799a, b). England and Wales were part of the crustal fragment that later formed eastern Avalonia. 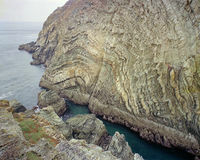 The rifting was the first stage in the development of the early Palaeozoic Welsh Basin, a passive margin basin of the type that develops over the site of an older subduction zone. Sketch map to show the geography of England and Wales during the mid Cambrian. P785834. Purple and green slate of Llanberis Slates Formation. P007343. The turbidites are better developed farther south, to the east of Harlech, where they make up a large proportion of the Harlech Grits Group (E1 and E2) that is early and mid Cambrian in age. The rocks show that the depositional environment changed from deltaic to marine where coarse-grained turbidites (wackes) accumulated, and eventually to a more open marine shelf environment where mud was deposited. The wackes thus decrease in abundance in the upper part of the Harlech Grits Group where there is a manganese-rich horizon, the Hafotty Formation, which forms an excellent marker horizon. The Harlech Grits Group together with the overlying finer grained Mawddach Group represent a complete cycle of basin formation and infill with few depositional breaks. Siltstone and mudstone of the Maentwrog and Ffestiniog Flags formations (E3) make up most of the Mawddach Group (2000m thick), but black mudstones occur at the base and near the top — the Clogau (approximately the E2–E3 boundary) and the Dolgellau formations respectively. 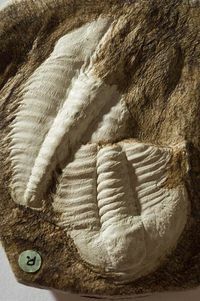 The Dolgellau Formation, which includes a bed packed with the small brachiopod Orusia, formed by fallout of organic matter and fine-grained sediment in oxygen-starved water. The topmost unit of the Mawddach Group is the Dol-cyn-afon Formation (O1). This is of Tremadoc age, but was included with the Cambrian in previous editions of this map. Along St Tudwal’s peninsula on Lleyn, the Cambrian strata are thinner in comparison with the Harlech and Llanberis areas, and the entire sequence is only 1100 m thick. The lithologies of the lower part are similar to those of the other two areas, and include coarse-grained turbidites of the Harlech Grits Group and the manganese marker bed. 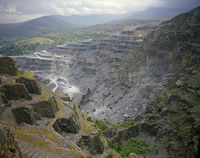 But between the Harlech Grits Group and the overlying Mawddach Group (about the Middle–Upper Cambrian boundary) there is a complex erosional unconformity, caused by local uplift. This represents a period of about 10Ma before this area was once more submerged to give an open-shelf type environment in which finer grained sediments were deposited. 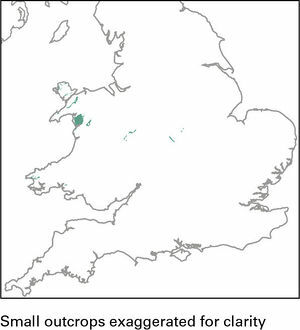 From this and other evidence, it can be inferred that the margin of the Welsh Basin lay somewhere to the west of StTudwal’s (Figure P785834). However, the shoreline of this landmass would have advanced and retreated from time to time depending on the relative rise and fall of sea level and on tectonic influences. In south Wales, a similar pattern of sedimentation emerges: the Caerfai Group (E1) passes from nearshore to offshore marine sediments and is early Cambrian in age. However in the mid Cambrian, the Solva Group and the Menevian Group (E2) are of nearshore marine origin and pass upwards into intertidal and marine sediments represented by the Lingula Flags (E3). There is clear evidence of the eastern margin of the Welsh Basin in Cambrian times. At Judkin’s quarry near Nuneaton, a basal conglomerate rests unconformably on unweathered Neoproterozoic rocks. 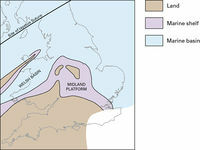 The conglomerate is interpreted as beach and foreshore deposits that accumulated in hollows on a wave-cut platform as the sea flooded across the Midland Platform on a palaeoslope that faced south-west. These are the lowest beds of the Hartshill Sandstone Formation (early to mid Cambrian age), which represents the initial deposits of a marine transgression across the landmass of Avalonia that bordered part of the western margin of the Gondwana continent. It is most likely that this flooding began in latest pre-Cambrian times following a phase of rifting associated with the opening of the Iapetus Ocean. But, at Boon’s Quarry nearby, the base of the Hartshill Sandstone Formation is exposed, and a type of clayey weathering seen there has been compared with modern-day lateritic weathering. This suggests that the unconformity preserves a land surface that had formed in a tropical or subtropical climate, such as might have prevailed in latest Neoproterozoic times. The coarse-grained red beds in the lower part of the formation (Boon’s Member) are the accumulated detritus shed from fault scarps. The sediments that were then deposited on top record widespread regional subsidence and submergence — Stockingford Shale Group (E3 and EO) which is grey mudstone but with red or maroon mudstone of the Purley Shale Formation (E2) at the base. 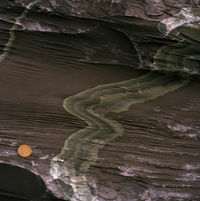 Deltaic deposits were gradually replaced by beach and shallow-water sandstones and eventually by deeper marine sediments. The Stockingford Shale Group (mid Cambrian to Tremadoc age) is made up largely of mud that was deposited over the Midland Platform at a time when little coarser grained detritus was available. But conditions varied and this is reflected in the black pyritous mudstone, deposited in poorly oxygenated conditions, and thin beds of glauconitic sandstone that indicate reworking of coastal sediments by tidal currents. A trilobite fauna owes its richness and diversity to the fluctuating environmental conditions. At the top is grey mudstone of Tremadoc (early Ordovician) age, the Merevale Shale Formation, which has a remarkably wide subsurface distribution in central and eastern England. Folded strata of the South stack Group (Monian Supergroup) Anglesey. P007923. To the north-east at Charnwood Forest, the Brand Group contains volcaniclastic siltstones and slaty mudstone (Swithland Formation); the younger Stockingford Shale Group is also present and has been proved in boreholes in Leicestershire. At Nuneaton, the Purley Shale (early Cambrian) and Mancetter Shale formations (mid Cambrian) are also included in the Stockingford Shale Group. In the Wrekin and the outcrops of Shropshire that occur along the Church Stretton Fault Zone there is a similar change from nearshore sedimentation of the Wrekin Quartzite and the Lower Comley Sandstone to offshore deposition of the Upper Comley Sandstone (E). An unconformity occurs at the base of the Upper Comley Sandstone (marking the base of the mid Cambrian); another occurs at the top of the mid Cambrian in the Wrekin and in the Malvern Hills, where the late Cambrian is dominantly mudstone and contains the Orusia-rich horizon. The Welsh Borderland Fault Zone, which includes the Pontesford Lineament and Church Stretton Fault Zone, marks the approximate boundary between the Welsh Basin and the Midland Platform, and there is evidence of movement on these structures during deposition of the Cambrian sediments. On Anglesey, the Monian Supergroup includes sedimentary and igneous rocks (South Stack and New Harbour groups see page 22; Plate P007923) that are part of a submarine turbidite fan system, and a widespread mélange (Gwna Group). The age of these beds has been disputed over the years; they were included with the ‘Precambrian’ in previous editions of the map, but recent research gives a maximum depositional age of 501±10Ma for the South Stack Group (Collins and Buchan, 2004†), and an Ordovician age has been suggested for the New Harbour and Gwna groups. This page was last modified on 28 July 2015, at 17:01.